Mondesi's House: DEKKER'S ARREST LETS MEDIA SAY, "STEELER ARRESTED"
DEKKER'S ARREST LETS MEDIA SAY, "STEELER ARRESTED"
Go to any number of websites today and you'll see a story with a title along the lines of "Steeler Arrested". After your heart skips several beats and you wonder who it was, you then see that it was tight end Jon Dekker, who was about as close to getting into game action this year as you or I. Honestly, the only reason I even knew of Dekker's existence was from the Steeler charity basketball game I attended in 2008. In case you've forgotten what he looks like (which I'm sure you have), here's a shot of Dekker taken about five inches away from me. Dekker, who attended Princeton, injured his knee in August and was on IR the entire 2008 season. He was signed as an undrafted free agent in '06 and spent that season on the practice squad; he appeared in three games in 2007. 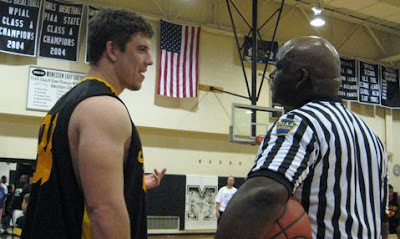 Needless to say, he wasn't exactly threatening Heath Miller for the starting tight end job. Dekker was arrested at 3:30 AM early Saturday in Alexandria, Virginia and charged with obstruction of justice. Which reiterates the line of thinking that few good things happen at 3:30 in the morning. So rest easy, Steeler fans, the 53-man roster is still nice and legal. Of course, there's seven days until kickoff...but for now, they're nice and legal. Is that game at AG? I was there. Woo. So yes, the media did its job by scaring the general public who wouldn't know who that Mr. Dekker is a VERY non-essential part of the Steelers.